Avocado has become known as a superfood for its many health benefits, which is super-fine by me since I eat it for its yummy goodness. I've found yet another reason to add it to the top of my list of truly "super" foods, however. 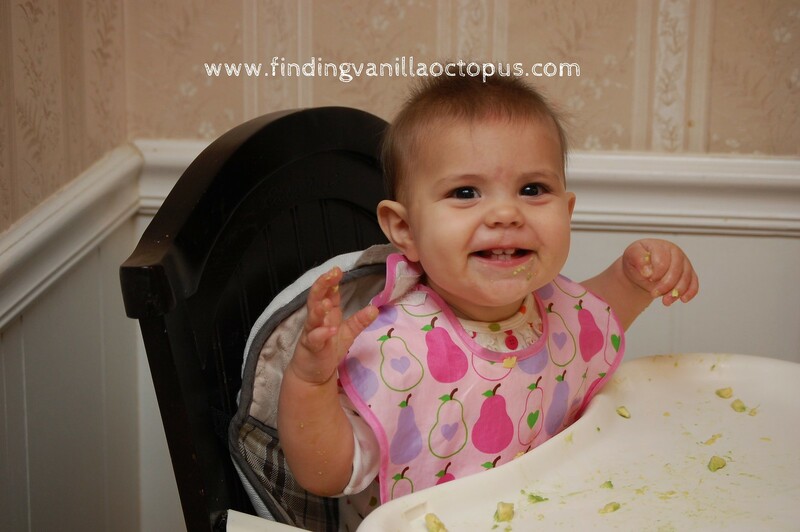 We've been slowly introducing solids for the past two months now, and while she'll sample a few bites of whatever I put in front of her, she usually ends up consuming only fractions of an ounce worth. I just can't seem to get her interested enough to make much of an effort. Then, last night, Tom brought home a ripe avocado and sliced it up to serve with dinner. I didn't measure exactly how many tiny pieces I placed on her tray; I only know that I had to keep refreshing the selection. Over, and over, and over. 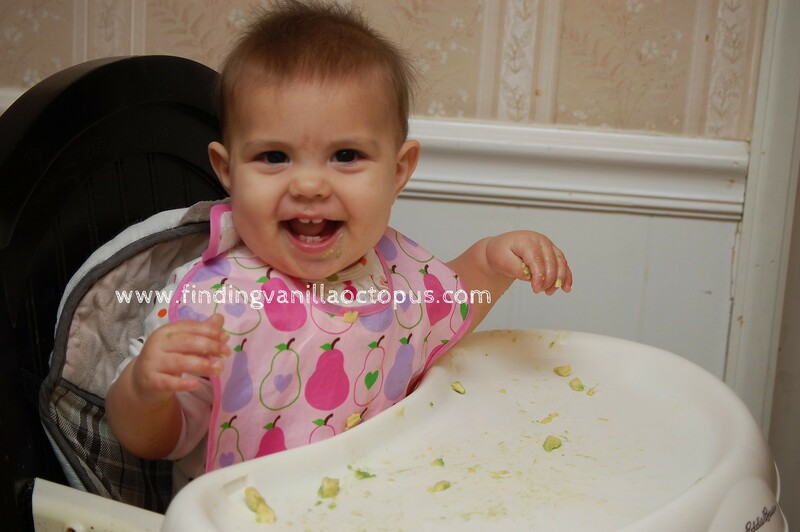 She went at the bite-sited morsels with an enthusiasm I've never before seen from her, and gulped them down with a smile. Of course, it helped that when Abby saw me pop in with the camera, she took that as license to act like the silliest version of herself for Mia's benefit. 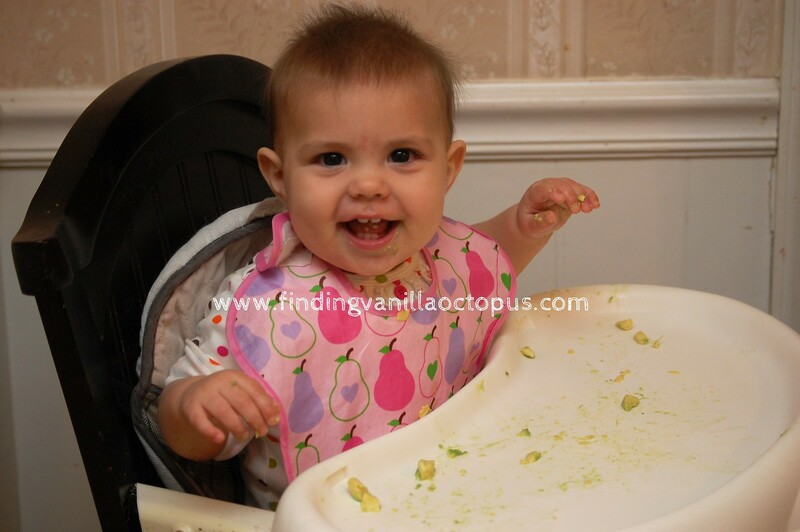 Still, I'd say that my pictures are an accurate portrayal of just how much Mia loved the stuff. Looks like we'll be stocking up on avocados around here for the foreseeable future. It's worth it, for that face (and a few other reasons, besides).